I’ll write a proper stuffed stuff post later, but I wanted to share this super quick post about these little guys! This year I’m contributing one pair of plushes & another to Desert Bus for Hope. If nothing goes wrong, these items will be auctioned off during the video game marathon of Desert Bus. All proceeds will go to Child’s Play Charity. #1. 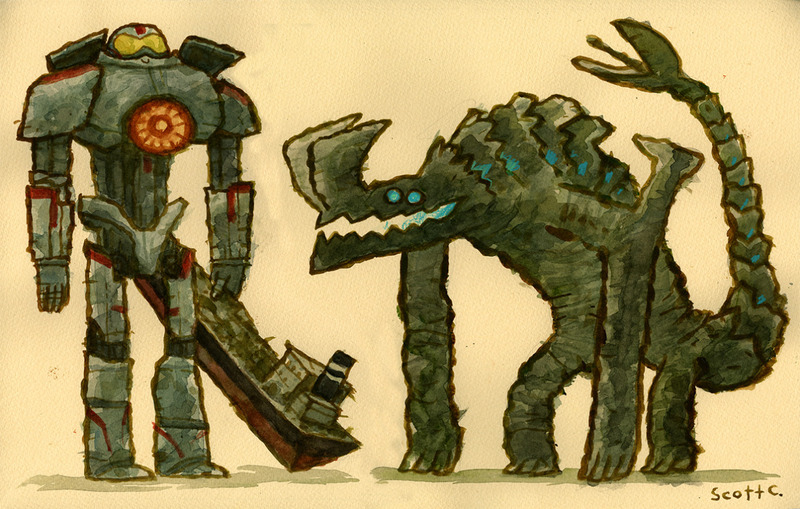 Gipsy Danger & Otachi, based on the painting by Scott Campbell from Pacific Rim. These will be listed as a pair. The removable ship will also come with Gipsy Danger. 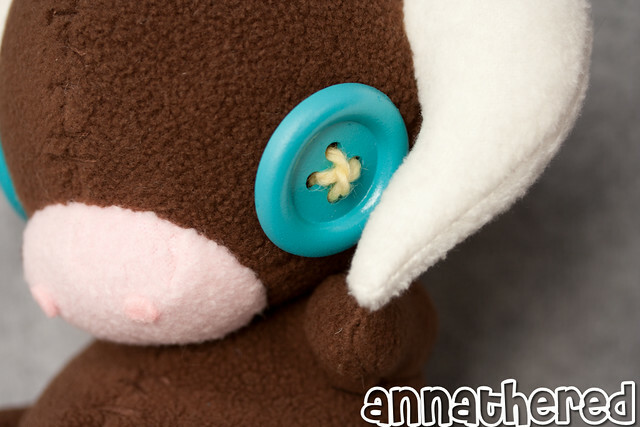 As you can see, this is a plush version of the painting by Scott Campbell, so some parts are simplified. 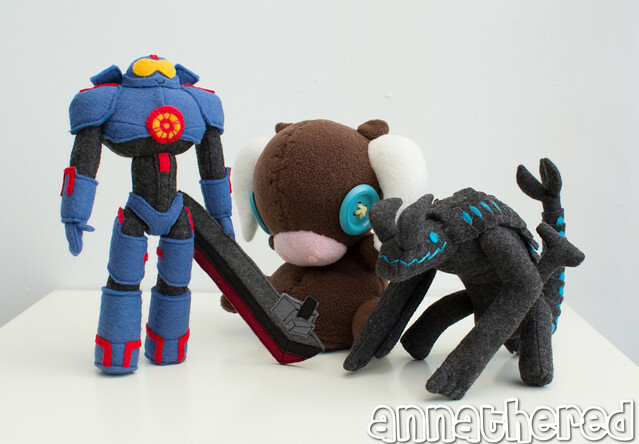 These plushes are NOT intended to be directly accurate to the movie designs. Here are some more close-up shots. 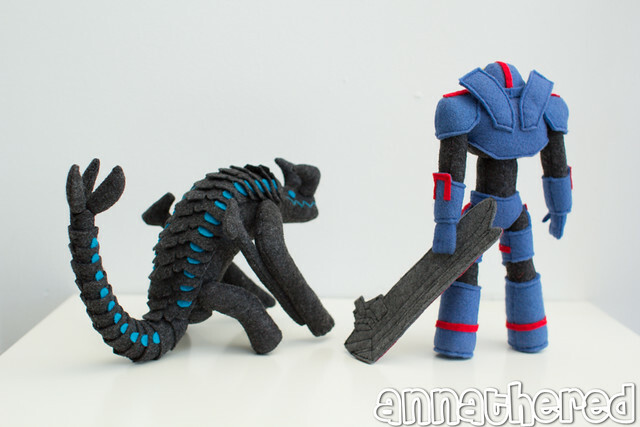 There are more photos of them on my flickr “stuffed stuff: Gipsy Danger & Otachi, based on the painting of Pacific Rim by Scott Campbell” set. Scott Campbell has been painting a series called Great Showdowns depicting famous movie showdowns. It’s fun to guess which movies each of them is from. Also they’re all really really cute. 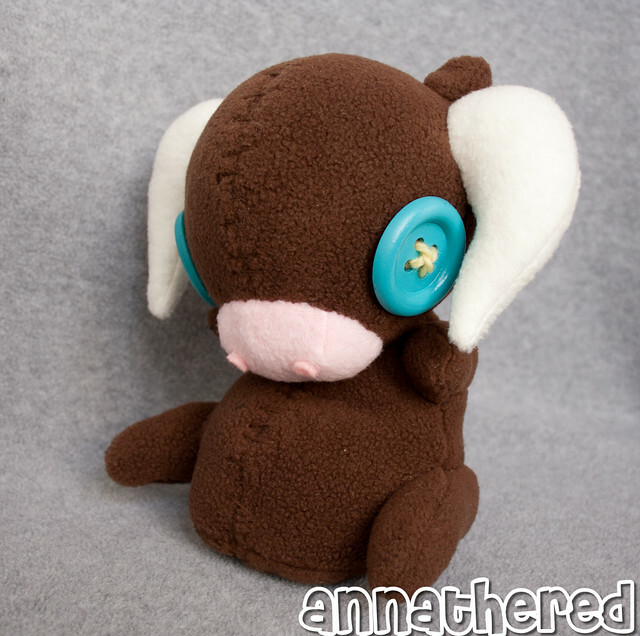 This is “version 1″ of the plush Pyth I made back in 2011. 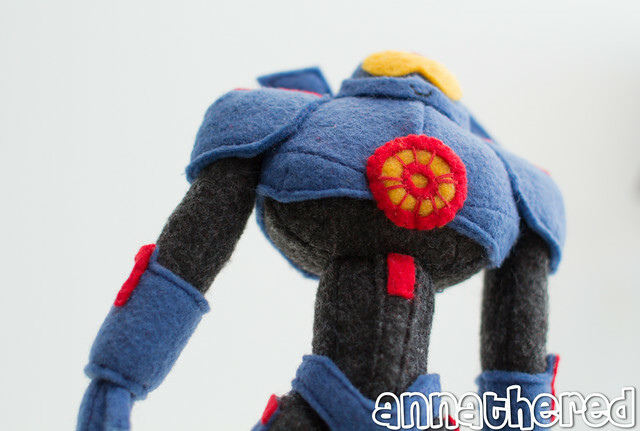 I wrote a blog post about it and you can check it out on stuffed stuff: Pyth from Bastion. Note: This is a version different from the version 2 of Pyth, which I gave to each staff member of Supergiant Games. 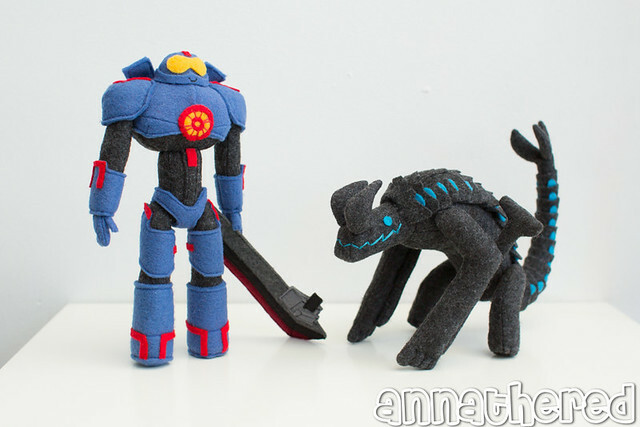 You can read about it on stuffed stuff: Plush Pyth ver.2. By the way, I do NOT take commissions for these, unless you are Guillermo del Toro, Scott Campbell (he’s getting one anyway!) or anyone from Supergiant Games. So if you like & want them, make sure you check the Desert Bus for Hope site for more details. Also there will be TONS of amazing geek culture related hand crafted stuff up for auction on Desert Bus for Hope! I’ll post a reminder about Desert Bus for Hope when it gets closer to the day. 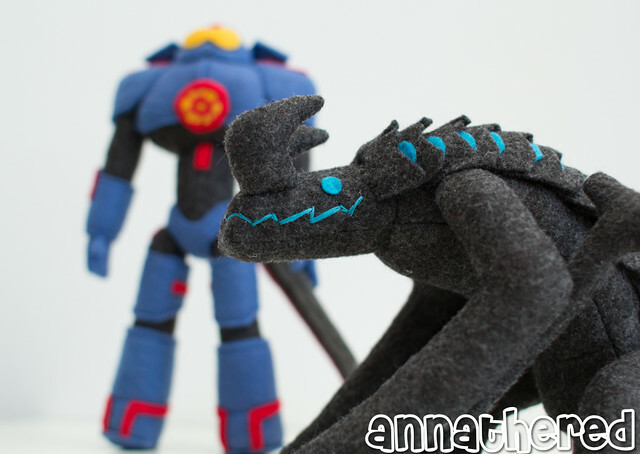 If you want to see more photos of these plushes, check out my “stuffed stuff: Gipsy Danger & Otachi, based on the painting of Pacific Rim by Scott Campbell” set or “stuffed stuff: Plush Pyth from Bastion” set on my flickr. awesome stuffies & i love that you’re donating to benefit child’s play! They make such a huge difference for kids in the hospital- you rock! !